... and how they helped make us who we are. This post is dedicated to a fellow blogger who lost a parent suddenly this past week. Hearing the news, it made me think about how our mothers and fathers shape us in ways that we often don't consider until after they're gone. Those of us who grew up inside nuclear families over half a century ago had relatively uncomplicated, simple upbringings. Our inner perceptions of those years likely haven't changed much over the decades. We remember a time when dads worked and provided for everyone while moms likely stayed home, acting as the glue that kept families together. As kids, we had freedom and security in a way that is both undefinable and incomprehensible by today's standards, mostly because today's idea of security involves weird and crazy over-protective concepts that didn't exist back then. So I wonder: are today's parents still the primary influences on their children the way my generation's parents were? Sadly, I doubt it. The very medium by which I am communicating this thought has taken over the shaping of today's generation. There are so many uncontrollable external influences — typically uncensored and unvetted — on kids today that the influence of the family unit may well be lost in the mix. That wasn't the case "back when". Take something as basic as politics... and I promise that's all I'm going to say on the subject. My political leanings were shaped quite early on by my father. I learned to type — on a manual typewriter — at the age of nine because my father used a typewriter. My strong interest and eye for photography was cultivated by my father. Dad also selected and bought books for me (remember Scholastic Books?) on a monthly basis during my early school years, turning me into an avid reader, and over time, an avid writer. However, unlike today's over-compensating and over-doting parents, I don't recall ever being told by my dad that I was awesome or that he was proud of me. I don't think I suffered for it... much. Although as a teenager, I did have moments of wondering — what do I have to do to get some praise? In any case, after one of his many hospital procedures before he passed, he told me, "I don't know what I'd do if you weren't here"... well, that made up for any slights that I may have felt during my youth. That said, I was and always will be my mother's daughter. In a way, it's fitting that she is my "remaining" parent. She and I share a closeness that would never have been equalled in a relationship between my dad and me. My mother now lives only five minutes away from me. We connect via phone twice a day. In warm weather, I might arrange to meet her for her morning walk halfway between our homes. She is independent, very vibrant and quite healthy. However, she did reach a milestone birthday this year and I can tell that it's made her more contemplative. During a recent conversation, I asked Mom how she learned how to sew. Oddly enough, the question had never arisen before, even as my own sewing hobby came to be revived over the past several years. I just had a mom who used to sew and it never occurred to me to ask how she came to acquire the skill. Apparently, when my aunt moved away after getting married, Mom inherited her sewing machine. She started using it and because money was tight, ended up making her own clothes and then clothes for her nieces. Her method was to take existing clothing and just trace the basic shapes around them. She did not ever buy a pattern. And yet, she would turn out pieces — dresses and later pantsuits — with obvious individual styles. Take a look at her basic shift/sheath dress at top left above. 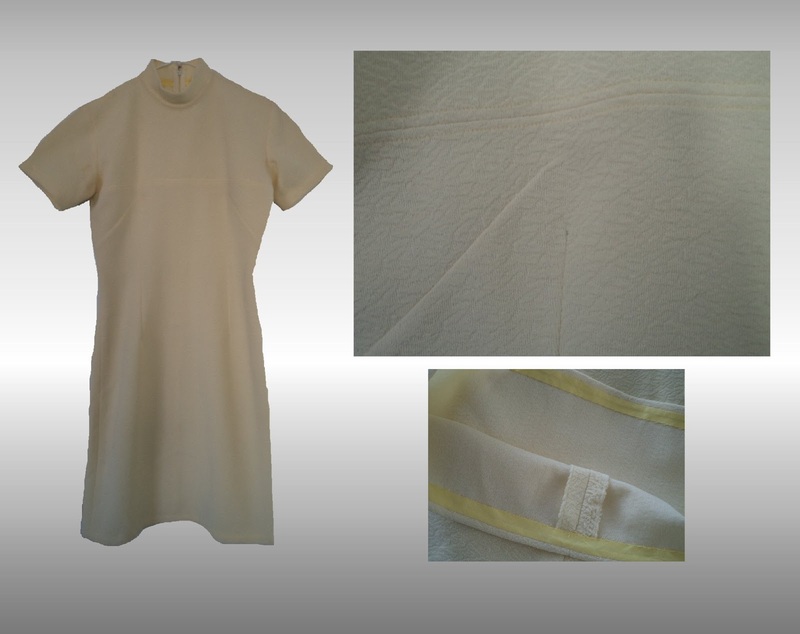 (This was her "go to" favourite style to sew: a mashup of a fitted shift and a loose sheath that had sleeves.) The other pictures shown are variations that she came up with for the top half of similar dresses. Here is another, with some closeups of the detailing that she incorporated into each and every one of her creations. Look at the yoke and darts and seaming on this dress! On occasion, with the same materials, she would make four or five dresses (for her, my aunt, my cousin(s) and me) and they would all be different! She was even "commissioned" by her friends to make clothing. When I discussed this with her last week, she didn't even seem to be aware of how talented she was back in her day. I like to think — even though she never formally taught me to sew (I learned at school) — that I inherited some of her creativity and natural aptitude for the craft. Her work had to have been a source of inspiration, even if I didn't actually know it at the time. When I moved her out of my parents' home after Dad died, we gave Mom's old Singer sewing machine to one of the movers. (It didn't work anymore and the guy said that his mother would love it for display purposes.) Yes, there were memories tied to it, but she knew that downsizing meant getting rid of "stuff" and what better time to do so than during a relocation. It would have ended up in Mom's (new) basement had she kept it... which is where Dad's typewriter is, by the way! In any case, memories are not all about physical things. As long as our brains stay alert and active — and yes, that's the challenge — our memories are always with us. (Or available via our diaries and photographs.) As long as we take the time to sit down and share stories about the people who have influenced our lives, they continue to live on long after they've left us. That's probably how it's been since the dawn of civilization. So the next time you talk to your mother or father, ask something that you've never asked before. Or play the "tell me something I don't know about you" game. Collect another story to remember them by when they're no longer here. Are there any obvious interests or talents that you inherited from your parents that you would like to share? Oh, to be able to sew without ever using a pattern - a skill I would love to have. My Aunty was a dressmaker and used to make my sister and I the most gorgeous dresses, never using a pattern. 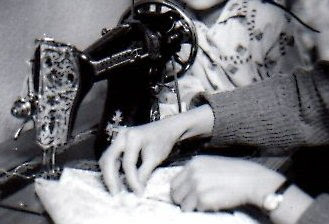 My Mum did the everyday sewing, usually using a pattern. I have inherited my green thumb from both my Mum and Dad. Rochelle, bringing up the sewing brought back memories for me. I think mom always used patterns, but you know I was young and didn't really pay much attention. Mom made my younger sister and I clothes when we were growing up. I would have the blue dress and my sister would have the same print fabric in pink. Those were our favorite colors. 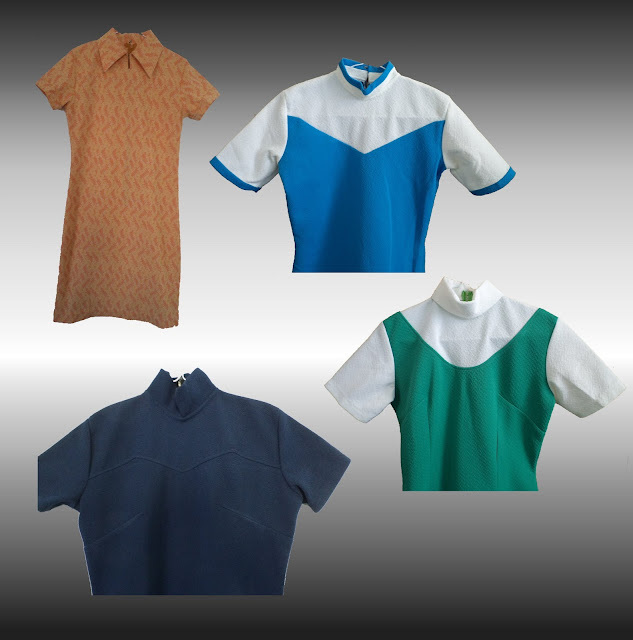 But my sister would end up having to wear the blue one when she grew, after I had outgrown it. Years later mom took up quilting by hand. So I suppose I inherited her love of sewing. Thanks Rochelle (wink).